New Cheat Sheet Productivity Guide Bonus! It’s Cyber Tuesday Special Time With a New BONUS Being Released Today! After our new EzineArticles 260 Ultimate Article Template Package was released, (our largest collection of the very best templates to write 5 unique and creative articles per week for every week in the year), our customers told us that a 260+ PDF was just *too much* to digest quickly. In an effort to make it more manageable, to save you time, and so you don’t overlook any great templates, we’ve created something called the Productivity Checklist & Cheat Sheet. This 4-page PDF document will give you instant access to the essence of each of our 260 article templates. Use it to become inspired about which angle or creative idea you can apply to write your next set of articles. When you find one you like, scroll to the full article template and begin writing! You can even check off each completed template idea with this handy, interactive PDF and save it to know where you last left off. It’s a $30 value but it’s yours free with purchase of our new 260 Ultimate Article Template Package. Frankly, I think this new 4-page article-writing productivity checklist is worth the entire price of the $97 product because I rarely read entire books or other lengthy material myself. I prefer to skim the summaries to get the essence of the ideas quickly. That is exactly what this 4-page “cheat sheet” guide provides. Note: All current owners of the product were just emailed their free Productivity Checklist. Essentially, our goal is to help inspire you to come up with new ideas to create fresh, new articles that you can use to help build your brand, your website traffic, your sales and your business! If you had to buy each of the templates, you’d spend over $229 USD, but we wanted to make this product more affordable, so we introduced it for only $97 USD (and a Cyber Tuesday special of only $77). That introductory special has come and gone, but we have an internal goal for how many Expert Authors we wanted to help with this product. We’re just shy of it, which means we’re going to give you one more shot to acquire this time-saving, creativity-inspiring 260 Ultimate Article Template Package at the lowest price we have ever offered it. For 2 days only, during checkout, use Coupon Code: UATP20SALE and you’ll save $20 USD instantly… making your total investment only $77 USD. This coupon code is good for 2 days only and absolutely ends at Midnight CST on December 19th 2014. Keep in mind, you also get our new 260 Ultimate Article Template Package *AudioBook version* that will sell for $97 by itself, but you get it for free during this special. Today, you get the full 260 Ultimate Article Templates PDF and our 4-page Productivity Checklist PDF via instant download, and then the AudioBook version will be sent to you via email for free when it’s finished. Our team has been in production of it all month with an expectation to release the AudioBook version before Christmas. The deadline to take advantage of this offer is this Friday, December 19th, 2014 before Midnight CST. 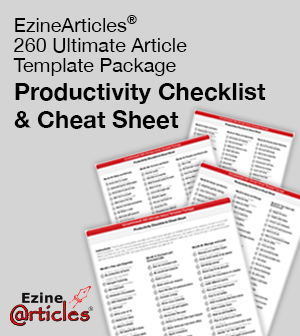 Get your instant download of the EzineArticles 260 Ultimate Article Template Package and new 4-page Productivity Checklist & Cheat Sheet, using coupon code: UATP20SALE during checkout to save $20! It is really great special offers for cheat sheet productivity Guide. I love this offers and would like to grab one.Thanks for this offers. Its time to save money. Great post, yes, Templates can be a real bonus to a writing campaign. Actually, these products are good for the practicing Authors, because, they will aid in writing, by making each and every step in writing easy, fast,enjoyable and at the same time saving time and energy, which are all an Author is sorting all along after. Who ever is capable of buying them, must go for them, without much waste of more times, to avoid out of store crisis. Best regards and happy Xmas to all in advance. Thanks Salihu! We’re all about fresh, new ideas and EFFICIENCY, which were driving forces behind this product. We’re excited to hear feedback from writers who are using these templates! Thanks for coupon. I’ve shared it to my friends. Great? I like the post. Great Post! These are the deals that really make the internet a more interesting place. Surely it must be very good, as we know: Content is king.